Gael Force - The consensus "best match on paper" of the first round, turned out to be the barnburner we all hoped for; 5th seeded Tomas Berdych vs. the wild card (in more ways than one) 81st ranked Gael Monfils, the former top 10 Frenchman on the comeback trail from injury. On Court Phillipe Chatrier, Monfils known as Sliderman had the big stage he relishes, the big opponent he loves to face and seemingly for the first time in too long, the health to play at the highest level of the sport. Monfils came out firing, going up two sets to love on the big Czech, widely seen as the only threat to Roger Federer's death march to the final. Moreover, it was the Frenchman, not the Czech as would be widely expected, who dominated the early ace total (12-2) in those first two frames. Suddenly, a loose tiebreaker in the third set from Monfils and some inspired play in the fourth set from Berdych turned the match on its ear. Suddenly, two sets all, the match turned into a slugfest. 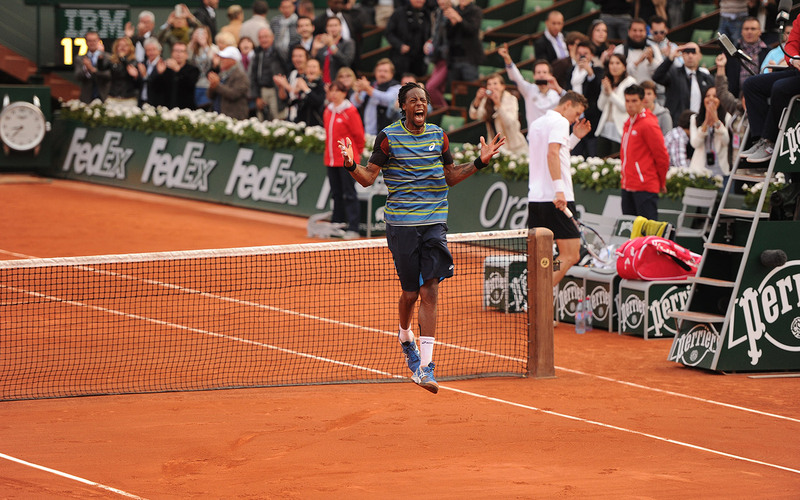 Berdych fired flame-thrower forehands, Monfils scrambled like "How'dHeDoThat" was his middle name. With a couple of inspiring gets deep in the fifth set, the titanic struggle was over. A shade over 4 hours after it started, Monfils had scored the biggest non-upset upset of the first round, in a pyrotechnic 7-6 (8), 6-4, 6-7 (3), 6-7 (4), 7-5 encounter. We've often said we would watch Monfils play tennis anywhere. This was a perfect example of why, Monfils not only plays with an unquenchable passion and uncommon athleticism, but he's also got the game to go deep into majors, provided he's healthy. The sinewy Frenchman served 72% on the day and threw down 26 aces in the process, firing 66 winners (+22 on the winner/unforced error ratio), Berdych didn't have a bad day either, he was +15. This was great stuff all the way around. Hopefully, the oft injured 26 year old had some more of these great moments left and even over this fortnight. Next up for Monfils, another mercurial talent, Ernests Gulbis. The Book of Nadal - Rafael Nadal opened his seventh defense of a Roland Garros title with a scratchy 4-6, 7-6 (4), 6-4, 6-3 win over Germany's Daniel Brands. When the definitive book on Nadal is written (were not counting his 2009 insta-autobiography) it will frame him as both one of the greatest champions to ever lift a racquet as well as one whom his closest competition largely couldn't figure out (save latter day Djokovic). The lesson the Serb's success should have taught the rank and file is that the 11-time major champion has an issue with zoning big hitters like Djokovic, Robin Soderling, Lukas Rosol and today, Daniel Brands. 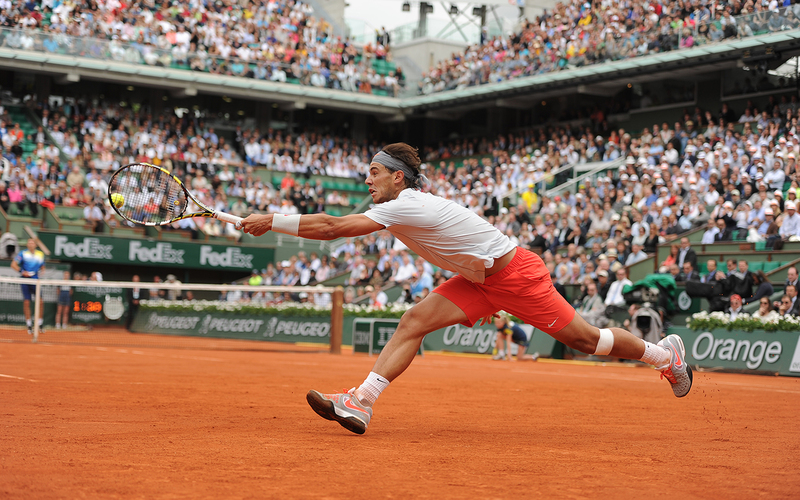 Nadal dropped serve only once today, but the challenge wasn't limited to the first set. He refused to wilt, suddenly, the King of Clay was facing a coup d'état from a veritable peasant in terms of major tennis. Brands has won fewer matches in majors (five) than Nadal has won Roland Garros titles (seven), but the challenge was no less stout due to history. The German fired forehands from line to line, sending Nadal scurrying for cover. 51 winners flew off the German's racquet, his high risk/high reward style keeping the pressure on for the first two sets before taking slightly off pace in the second set breaker taken by Nadal. From there, Nadal looked set to take flight, scoring early breaks in the third and fourth sets, but the German kept the scoreboard pressure on, never falling back more than the initial break. 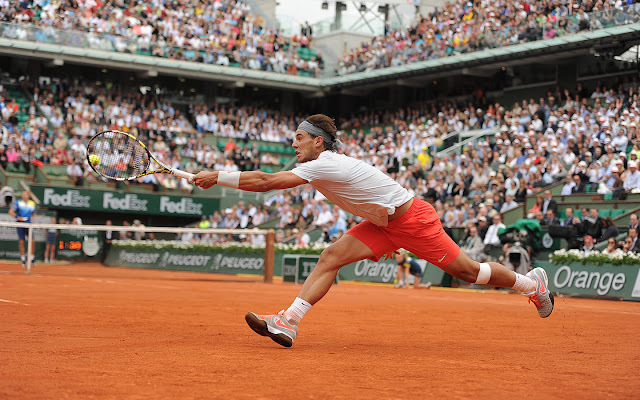 The King of Clay would survive the ambush 4-6, 7-6 (4), 6-4, 6-3. With a difficult draw and the specter of Djokovic on the horizon in a potential semifinal, this was either a seemingly unnecessary reminder to Nadal not to overlook his early competition and/or a lesson to the men who will come later on the way they'll have to play to get it done, for more than two sets. American Pie - For all of our woes on red clay, the Americans completed a fine day on European clay. The Stars and Stripes contingent finished this Memorial Day an encouraging 8-4. Laboring on the back courts of the Roland Garros complex the day ended with wins for John Isner, Sloane Stephens, Bethanie Mattek-Sands, Varvara Lepchenko, Melanie Oudin, Ryan Harrison, Vania King and Madison Keys. Even Steve Johnson and Christina McHale who lost pushed their opponents to 5 and 3 sets respectively. Are things turning around for the Americans on the terre battue? Too soon to say, but at least we won't be making that judgment before the end of the Memorial Day weekend. These watches can certainly quietly sparkle on any one's wrist along with promptly help to make the actual individual really rolex replica feel special- prior to the audience all around him. hublot replica The unique qualities of diamonds and how are usually they graded will help you determine whether you are being charged fairly for the watch that you are buying. hublot replica sale It's the quality of the diamonds that ultimately decides the price of the watch. A diamond watch has always been associated with fashion, elegance and class. rolex replica If you desire to add at the dash of glamor in your wrist, or give one to be a gift to that special woman in your life, fake hublot then you want to know how to attempt to buy such a precious thing.